If you are missing one or more teeth, you know how much incomplete dentition can affect your daily life. It is more difficult to speak properly and chew the foods your body needs to stay healthy. You may hesitate before laughing around friends and coworkers, and even hide your smile behind your hand in social situations. 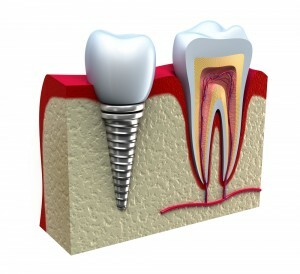 Fortunately, there is a solution in the form of dental implants. Dr. Chitra P. Naik in Flint, MI helps patients with missing teeth enjoy a complete smile once again, improving their oral health, self-confidence, and wellbeing overall. When a patient is missing teeth, the density in the jaw bone begins to deteriorate over time due to a lack of tooth root to support. This can lead to the loss of additional teeth and even undesirable cosmetic changes that are visible in the face. Individuals with missing teeth are also more likely to suffer from periodontal disease, a serious condition that contributes to other health problems like heart disease, high blood pressure, and even dementia. When Dr. Naik replaces your missing tooth with a permanent dental implant, a tiny post of titanium is placed within the jaw bone and gum tissue to serve as a root for your new tooth. Following a period of healing, a restoration that looks and feels just like a natural tooth is placed atop the implanted post. Your dental implant restoration is then complete, allowing you to enjoy all of the benefits of a complete set of teeth. Whether you are currently missing teeth or you have an extraction planned and need to explore your options for tooth replacement, Dr. Naik can help. From our conveniently located dental practice in Flint, MI, we help patients just like you reclaim beautiful, fully functioning smiles with a variety of restorative dentistry procedures. Contact our office today to schedule your consultation. We also happily serve families from nearby communities in Davison, Flushing, Fenton, Ortonville, and throughout Michigan. We look forward to helping you discover the many advantages of a complete, healthy smile once again. by: Dr. Chirta Naik at May 19, 2016 .